Could it be that JFK is not Kennedy but Kerry? Or how about John Francis Kelly as in General Kelly. Seems like I remember Bill Clinton was a Rhodes Scholar. What does a 'Flower' represent? 226 posted on 02/12/2018 8:42:09 AM PST by Steven W.
What does a ‘Flower’ represent? What does a Flower represent? Resolution Copper has proposed to give the federal government 4,500 acres (18 km2) of environmentally sensitive land in Arizona in exchange for the 3,000-acre (12 km2) proposed mine site, which includes the popular Oak Flat Campground, a protected area since 1955. In December 2014, the United States Congress passed, and President Obama signed the 2015 National Defense Authorization Act, which included the provisions of the stalled (**since 2005 - edit**) Southeast Arizona Land Exchange and Conservation Act. The Act cleared the way for the land swap in which Resolution would receive 2,422 acres of National Forest land in exchange for deeding to the federal government 5,344 acres of private land. The mine would destroy an area set aside in 1955 by President Dwight D. Eisenhower which is sacred to the San Carlos Apache Indian Reservation. Both the Oak Flat Campground, an area dotted with petroglyphs and historic and prehistoric sites, and the steep cliffs at Apache Leap would be affected. Resolution Copper [Anglo ownership] is a joint venture of Australian Rio Tinto Group and UK’s BHP. The Minister for Foreign Affairs, [Alexander Downer], and former President of the United States, [Bill Clinton], signed a Memorandum of Understanding which will provide $25 million from Australia over four years. Then Aussie Minister for Foreign Affairs(1996 to 2007) and now Aussie High Commisioner to UK (since 2014) [Alexander Downer’s] drinking buddy in London? Shine light on APACHE, see $enator$ scurry. The Sound of Freedom! So what are your thoughts on the link to their site that I posted, the one that was against Trump? Great concept. JF Kerry is one of the biggest frauds ever associated with American politics. Deflowering refers to taking away ones virginity, as in by force. Michelle’s wearing a dress by Michelle Smith’s label, Milly. Her painting also features Sherald’s gray skin tones. 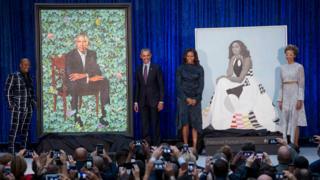 Obama’s painting features the official flower of Chicago and African blue lilies are a nod to his late Kenyan-born father, Barack Sr.
Should be Datura and Hemlock, respectively. I attended a wedding for 650 on the side yard and finally learned what the term “beautiful people” meant. They really do spend money to avoid showing normal aging. Almost no “normal” people in the tent. Except us, of course. Obama sitting in the same type of chair. The new Shadow King. He is also “man-spreading” to show his dominance. Flowery background could symbolize lotus eaters. His new world empire is built and financed by drugs. Flowery could also signal homosexuality. That is the most undignified presidential photo I could ever imagine..
That APACHE might be the bingo we’re lookin’ for, alright!